The final league game of the season for the 17s and with nothing at stake for either side it was good to see both sides making a number of changes for today's game. A cracker of a game played in poor weather conditions saw the U15s earn their third win in a row and move to the top of table. Congratulations to Waterford FC midfielder John Martin on his selection for the Republic of Ireland U19s. Waterford FC Under-15s made it two wins in ten days against Wexford FC after a 2-0 win in Ferrycarrig Park on Tuesday evening. 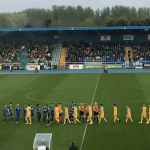 Waterford FC were crowned Under-17 Mark Farren Cup winners on Saturday afternoon after a 4-2 win over Sligo Rovers at the RSC after a tightly-contested final. David McDaid struck the only goal of the game as the Blues ran out 1-0 winners over Longford Town on Friday night before being presented with the First Division trophy. Waterford FC Under-17 captain Jack Larkin says his side are in it to win it in Saturday's Mark Farren Under-17 Cup final at the RSC v Sligo Rovers. Waterford FC captain Kenny Browne has spoken of his delight after the club was promoted to the Premier Division with two games remaining. 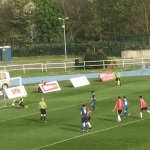 A brilliant performance from Waterford FC's Under-15 side saw them defeat league leaders Wexford on Sunday afternoon at the RSC. Our final south east Derby of the weekend ended in a 0-0 draw for the U19s in their final league game of the regular season.